Condrieu is one of France's rarest wines and this is one of the best! Limited quantities, 0 cases available. We're sorry but due to overwhelming demand this wine is no longer available. Guigal's flagship white wine sourced from the mature 35+ year old vines on the steep terraced vineyards of Condrieu. 100% Viognier aged in new oak barrels for 8 months and 100% malolactic fermentation. 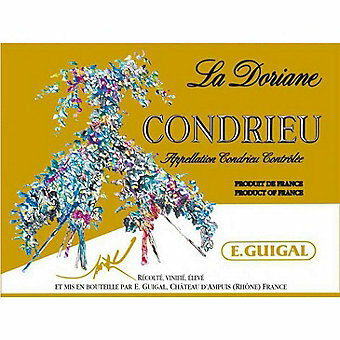 The Wine Advocate scored this 94 points saying "Bottled in June 2017, the 2016 Condrieu la Doriane is entirely barrel-fermented in new oak. This vintage seems more restrained and less rich than some others, but it remains marked by smoky, grilled apricot aromas and flavors. It’s nicely balanced and not overly opulent, retaining a sense of elegance on the long, spicy finish." Wine Spectator scored this 95 points saying "Very exotic, with showy singed hazelnut and matchstick notes in front of unctuous peach, pear, fig, and quince flavors. The honeyed finish flows through with a beautiful feel. Not for everyone, but you can't deny the display of fruit. Drink now through 2020." Vinous scored it 95 points saying "(aged for eight months in new oak barrels) Light bright yellow. Expansive aromas of ripe nectarine, pear liqueur, candied fig and pungent flowers, along with a smoky mineral nuance that builds in the background. Palate-staining, impressively concentrated citrus and pit fruit flavors show superb clarity and become more energetic with air, picking up a touch of lemon curd. The mineral and floral qualities come back emphatically on the extremely persistent, penetrating finish, which shows a suave blend of power and finesse." and Jeb Dunnuck scored this 96 points saying "The flagship 2016 Condrieu La Doriane also shows the freshness and more classical style of the vintage. Citrus blossom, crushed rocks, honeysuckle, and orange blossom give way to a medium to full-bodied, incredibly elegant Condrieu that gains depth and richness with time in the glass. It will be better this time next year and keep for 7-8 years." Sign up for Wine Express emails for discounts and more! © 2019 Enthusiast Companies. All rights reserved.